Located in Ciutat Vella, Barceló Raval is next to popular attractions like Rambla del Raval and Raval Cat. This 186-room, 4.5-star hotel welcomes guests with conveniences like an outdoor pool, free in-room WiFi, and a fitness centre. Enjoy a bite to eat at B-LOUNGE, the hotel's onsite restaurant. Satisfy your hunger from the comfort of your room with room service. Buffet breakfast is offered for a fee each morning from 7 AM to 10:30 AM. A 32-inch plasma TV comes with cable channels, and guests can stay connected with free WiFi and wired Internet. The bathroom offers a rainfall showerhead, hairdryers, and free toiletries. Other standard amenities include an iPod dock, a minibar and a safe. 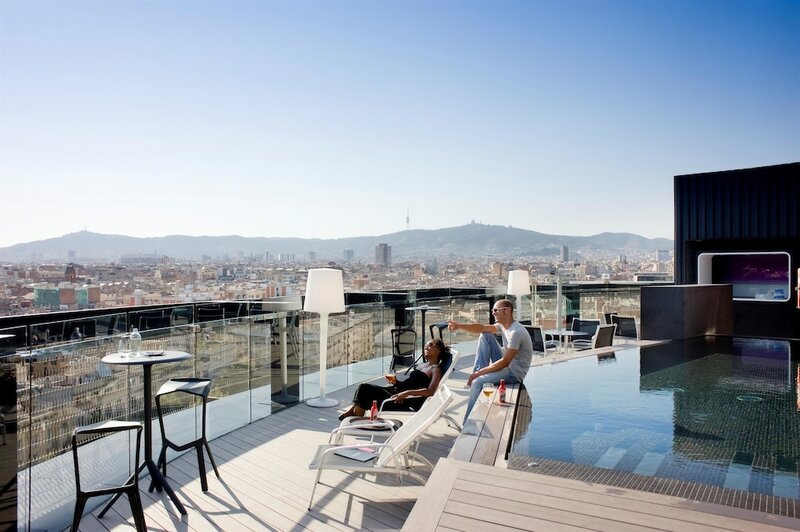 Guests of Barceló Raval have access to an outdoor pool, a fitness centre, and a sauna. Multilingual staff at the 24-hour front desk can assist with luggage storage, tours or tickets, and dry cleaning/laundry. Other amenities at this luxury hotel include a rooftop terrace, free WiFi in public areas, and a library. In addition to an outdoor pool, Barceló Raval provides a sauna and a fitness centre. The hotel offers a restaurant. A poolside bar is on site where guests can unwind with a drink. Wireless Internet access is complimentary. This luxury hotel also offers a rooftop terrace, a library and tour or ticket assistance. Barceló Raval is a smoke-free property. B-LOUNGE – This restaurant serves breakfast, brunch, lunch and dinner. Guests can enjoy drinks at the bar. Rollaway/extra beds are available for EUR 100.0 per night. Cash transactions at this property cannot exceed EUR 2500 due to national regulations. For further details, please contact the property using the information in the booking confirmation. Reservations are required for massage services. Reservations can be made by contacting the hotel prior to arrival, using the contact information on the booking confirmation. Only registered guests are allowed in the guest rooms. The property has connecting/adjoining rooms, which are subject to availability and can be requested by contacting the property using the number on the booking confirmation.